Fabric Paper Thread: October is Here! Welcome, October, my favourite month of the year. September hovers between summer and autumn. October sees true autumn: shortened cool days; brisk, even frosty nights; alternating sunshine and rain. The dahlias still bloom prolifically. Every few days I clip another small vaseful. I can see them growing from my kitchen window and admire them at every stage. It's time to light candles and focus on home. Saturday I puttered about the house all day, making things sparkle for the beginning of this season. I washed the downstairs windows and cleaned the grime from the sliding tracks. Has someone invented an efficient way to clean these? A cloth and a knife for getting into those 90 degree angles are what I use. My few silver pieces gleam; baseboards are dusted, and the house seems to sigh in contentment. We walked around the Bog this afternoon. Clouds teased us with their forays across the sun, but no rain fell. 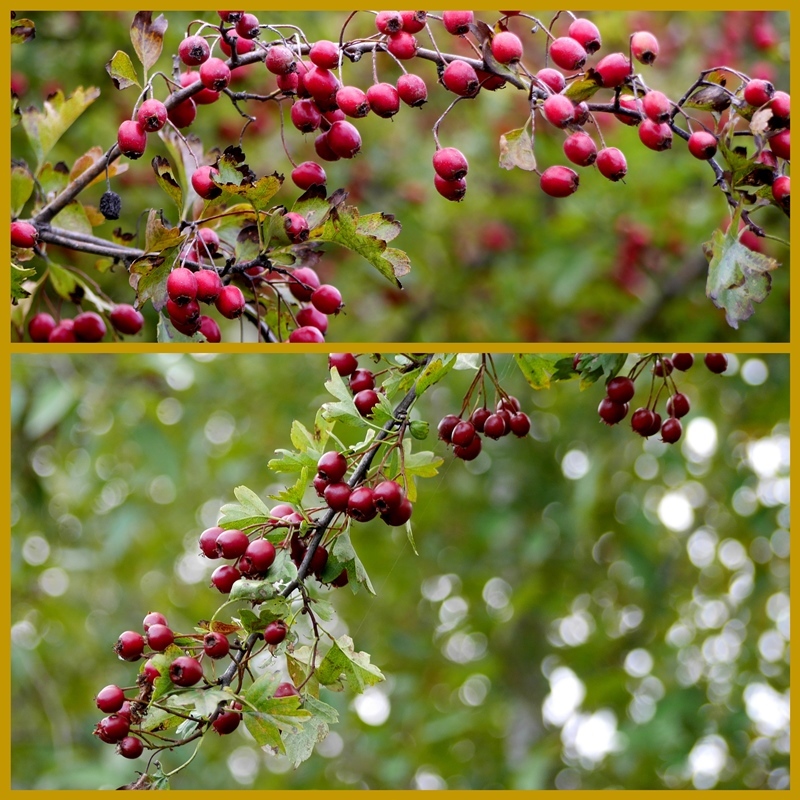 Hawthorne trees are rich with berries. The Bog is mostly dry, awaiting rain. A few trees, very few, show signs of colour. As these 31 days pass, more and more colour will appear and leaves will drop to the ground - perfect for scuffling. After returning home I set myself up in the kitchen and made a big batch of pastry dough. Two unbaked pie shells rest in the freezer, ready for next weekend's Thanksgiving (Canadian) pumpkin pies, a Spiced Plum Pie will head there as soon as it's completely cool, and the dozen apple hand pies are diminished to less than half. For tonight's supper I used more pastry for a Tomato Pie, full of cheese and herbs. Here's a link to the Tomato Pie recipe, on my other blog. I didn't use the pastry in that recipe as I'd made a big batch of regular pastry. I have to say that the one that goes with this recipe gives a richer flavour to the savoury pie. Also, I substituted the cheese I had on hand. The key is to letting those tomatoes drain for at least an hour. This was a lovely weekend. I'm left feeling rested and satisfied, and ready for the week ahead. 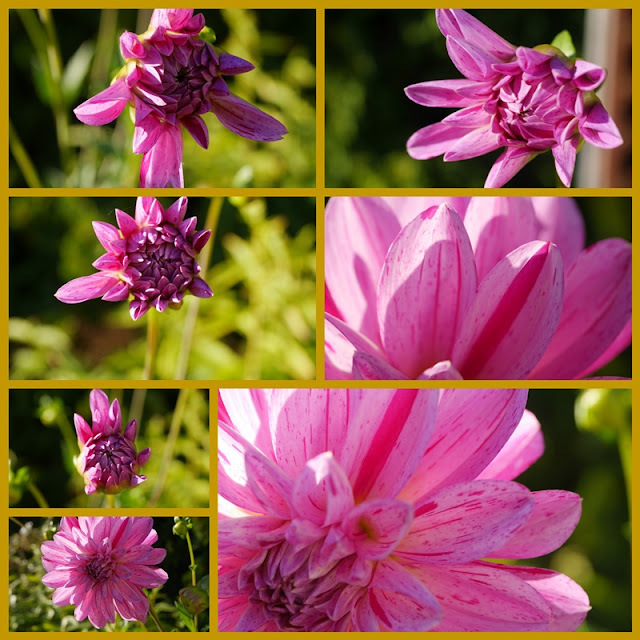 I love the rich mellowness of October and your mosaics this week capture it beautifully. Your pastry is so light and crispy looking, I imagine it would just melt in the mouth! Beautiful October photos. Your pink dahlia is stunning in its sparkling color. All the best. Thanks most sincerely for sharing another so wonderful post of yours, darling Lorrie ! Oh yes! Thoughts turn to Thanksgiving. We won’t be celebrating your Thanksgiving with you as we have done in previous years, though we will be together as family. Your home looks Thanksgiving blessed already! Your baking looks divine. Mmmmm. I wish my home was 'sparkling' - so much dirt tracked in from the workmen (and us) with not a drop of rain in over two weeks to settle the dust. Also an unbelievable number of spider webs in and out - guess as much as we don't want rain - the painters are working this week - we really do to get a feeling of clean! After all is done I'll be kept busy including those pesky window tracks! 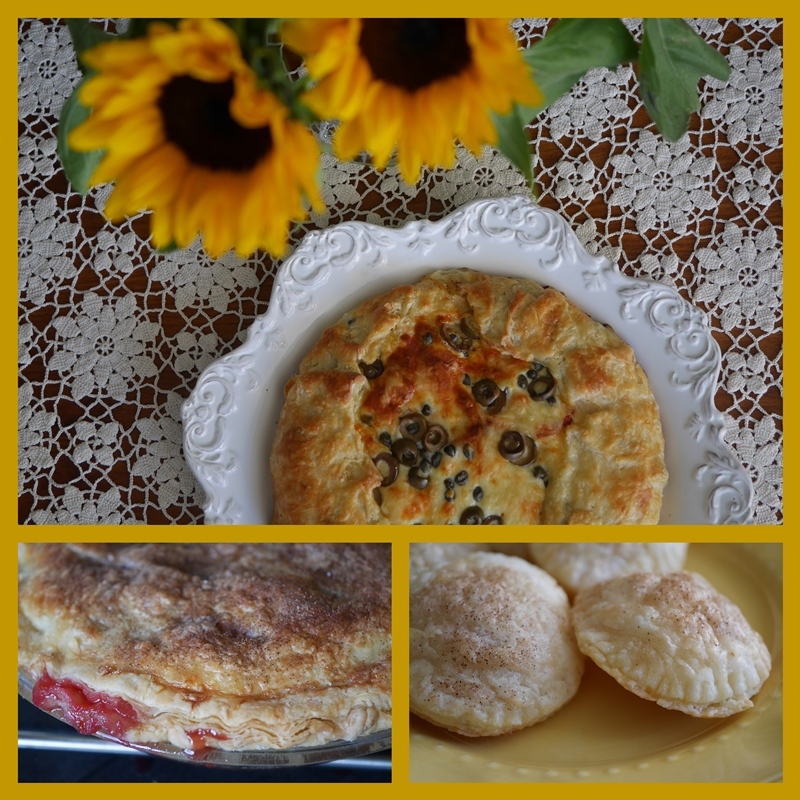 Pretty post Lorrie, and your baking is making me hungry. Today I need to get out and buy groceries - pies sound yummy! I enjoyed your post, Lorrie, beautifully written and so full of doing. I love this time of year as well. Your dahlias are really so pretty. I am still picking the last of the sweet peas which just keep going on and on! Please post your tomato pie recipe, it sounds ideal for a chilly day. Beautiful color and blooms in your world. The tomato looks amazing. You've been busy, but it sound like satisfying work. A tomato pie? Sounds yummy! Your home must be lovely and a welcoming place at the end of the day for you and your husband. Beautiful mosaics and lots of warm colors here. Those pies are artwork to my eyes! Hope you have a good week. I love tomato pie! your Dahlia's are gorgeous. Beautiful post ... I sighed along with your house! Happy Monday! Beautiful mosaics, the flowers were a real delight. The baking was sheer bliss, always such a nice feeling to put things away in the freezer. Meals all ready for those busy and special days. What beautiful flowers and I always love seeing the colorful leaves and berries in the Fall. Thanks for the recipe too. I always bake...and cook more when it gets cool. Hugs! Hi Lorrie. I love the pink in your dahlias. So pretty! It is a lovely cosy time of year isn't it? The trees are changing quite quickly here now and leaves are littering the ground. Your tomato pie looks so yummy and perfect for a cool fall evening. Have a wonderful October. It's always nice to see you on IG. oh yes, it looks like a wonderful weekend -- if you find a more efficient way to clean those darn sliding door slides, let me know! We have so many of them ... both our tiny homes are made beautifully livable by all the glass doors, but neither glass nor tracks are easy-to-clean! I enlarged the photo that has the little dish of magic stones because I wondered what they said -- now I think they are probably names of your family? Instead of the meditation words I've seen before. Lovely ode to Autumn post; thanks for all -- I'm off to look at your tomato pie recipe. Your pictures are magnificent. Oh so much of the changing of the season. I am checking out that tomato pie recipe, as we are still getting ripe tomatoes. Hoping to continue getting figs too, as there are many unripe ones on the tree. Your pies sound oh so good too. Yummm, plum pie. I really enjoyed seeing the colors of your world today,and your enjoyment of autumn. Do you eat hawthorne berries? The pies sound delicious. I am lovely the spring wildflowers in my corner of the world right now. Have a lovely week. Lorrie - your first mosaic is just splendid - I felt like I was there watching the flower open! Your baking has really put me in the mood. We have some family coming to visit this weekend, so it will be the perfect time to have some sweet, baked goods around the house! Happy Thanksgiving to you! I have to clean the tracks on my sliding doors too! Autumn is my favorite time for these home tasks, especially after a busy summer. What a lovely post and your pastries look scrumptious! I have never had plum pie and it sounds delightful. The tomato pie looks delicious as well. Yes, tracks are a pain to clean. Hubby always does that job and he will be doing a lot more jobs for the time being because my CTS makes it difficult to do most things. I may have to have someone come in and do the housecleaning for me soon as I don't like to ask Hubby to do everything. You asked about my calico plates. They are from Sears. Thanks for your visit and have a lovely week. Love the deffused sunlight shining through your dahlias. Why is it that mostly when I visit here I end up feeling peckish? I love it when the windows are clean...I had the outside of ours done professionally as my husband dislikes climbing up on the ladder. It makes a big difference! Lovely pictures Lorrie...you really have a gift. Enjoy your week the weather should be beautiful...perhaps another walk is in order! Lorrie, your photographs are gorgeous! Autumn is my favorite season too. Lorrie, It must feel great to start a week ready and rested. Good food, a bit of exercise, and a bit of cleaning. I'm so glad for you. Thanks for sharing and have a great week. Sylvia D.
Ah, the delights of the season....so lovely through your lens. Happy Thanksgiving to you and yours. Oh my Lorrie dear, your photos are simply a gift in themselves!! You mesmerize me with their beauty. Yea for you in making your house shine and then doing all that baking. I love tomato pie. I'll check out your recipe. Yes, letting tomatoes drain properly is key. You are such a gifted photographer. I can't believe it is almost Canadian Thanksgiving. Where has the time gone? Getting these kind of things accomplished makes me sigh in relief too. I especially love clean windows! Baseboards are a bonus. A clean house and food in the freezer makes me feel ready to face the world. =) Happy Thanksgiving to you! It strikes me year after year that that Canadian Thanksgiving is set at the right time...at the fulfillment of harvest time.